The specially-priced Himolla Palena integrated recliner is wrapped in fine, luxurious, silky-smooth leather. The integrated ottoman is preferred by those customers that don't like having a separate, independently operated ottoman. Normally, customers over 5'11" or so still prefer the Palena with a separate ottoman, since it can easily be adapted to even the tallest users. You can view the Palena with separate footstool here. The Palena is most easily recognized by its multi-layered, generous comfort sections. Customers really enjoy the plush comfort and extremely soft, yet supportive feel. The armrests are extra-layered to relax your tired arms and wrists like no other chair you've experienced. 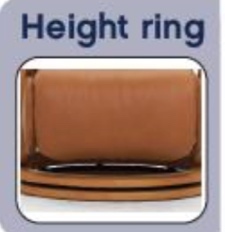 Take a look at the images and notice the armrest cushioning. There aren't many chairs out there that offer this level of plush support. The built-in (integrated) footstool requires less space than the Palena with separate ottoman. Super handy footrest easily kicks-out from underneath the chair with minimal effort. 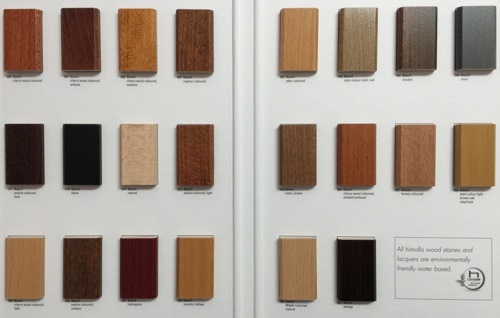 Chose from a wide variety of beautiful base selections (this page is for wenge stained). 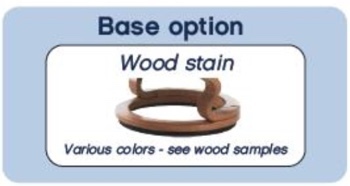 Wood stain chart (above) is for comparing this stain with other available models. Feel free to drop us a note, line or chat if we can assist you in the wood stain selection process.